Science Walden Pavillion, a unique blending of creative studio and research lab is now open to the public on May 25th, 2016. A brand new outdoor laboratory has been recently launched at UNIST and this is expected to convert human waste into renewable energy sources, and possible to a monetary value. Nestled in the center of UNIST campus, a brand new outdoor laboratory, called Science Walden Pavillion opened to the public on May 25th, 2016. 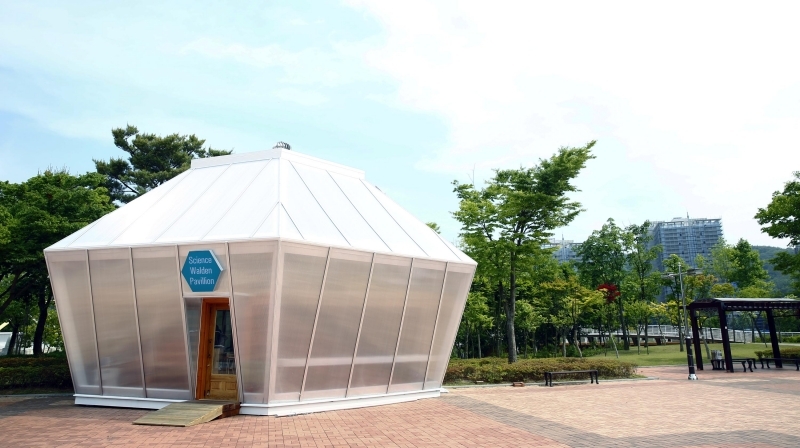 The pavillion, designed by Artist Seung-hyun Ko, Co-Founder of the Korean Nature Art Association (Known as YATOO), consists of two floors with a total area of 122.25㎡, featuring walls of translucent polycarbonate to allow visual connection between the inside and outside of the pavillion. 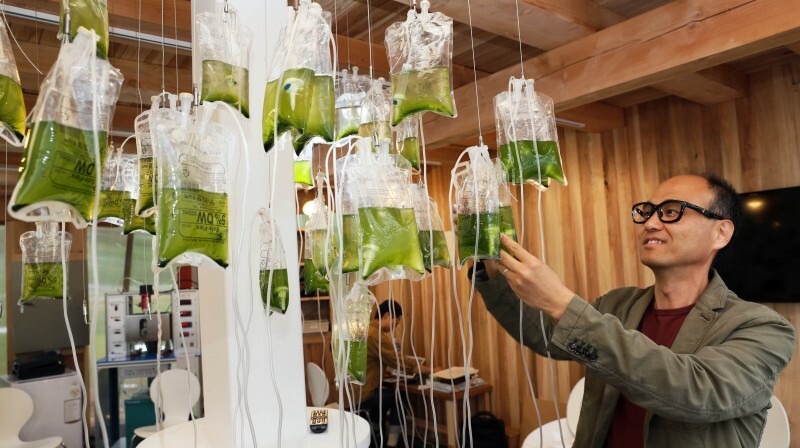 Director Jaeweon Cho of Science Walden Pavillion, examining the Green Algae Tree Structure. 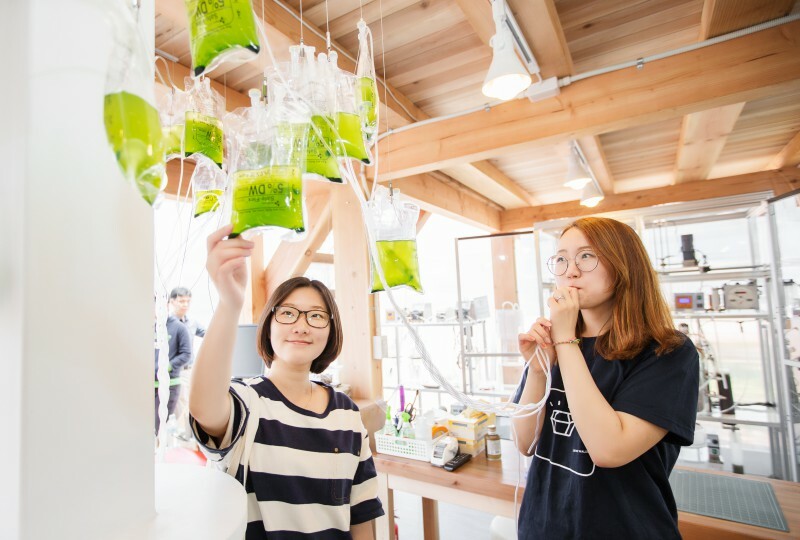 The major research facilities of this pavillion include “Waterless Energy-producing Toilet System” and “Microbial Energy Production System”. The waterless toilet system, located on the first floor of the pavillion treats human excrement without using water. The system utilizes a natural biological process to break down human waste into a dehydrated odorless compost-like material. Then, at the microbial energy production system, this compost-like material is converted into biodiesel or heat energy. The waterless energy-producing toilet system, located inside the Science Walden Pavilion. 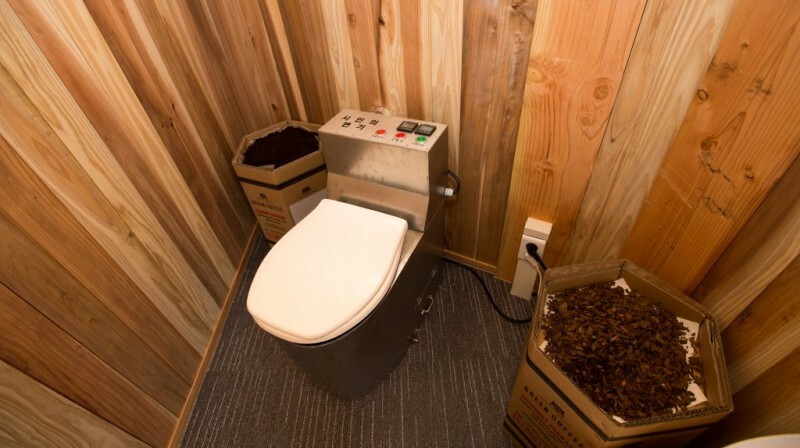 Once the grinding system inside the toilet converts feces into a dry, odorless material, it will be transferred to a digestion tank, containing thousands of different microbes. The microbes inside the tank will, then, biodegrade the powdered human manure to generate carbon dioxide and methane. Using high pressure and membrane, carbon dioxide is extracted to culture green algae for biofuel while methane is stored for later use as a heating fuel. The project aims to reduce urbanization’s negative footprint on ecosystems by safely converting human waste into viable renewable energy and possibly to a monetary values. Researchers working on experiments at the Science Walden Pavillion. To reduce the objection of using the facility, Prof. Cho and his project team added a unique artistic touch to this collaborative outdoor laboratory. They have designed a futuristic toilet with groundbreaking innovations in sanitation technology that is comfortable at the same time. A roof garden, which filters rainwater and provides insulation is another added value to this pavillion. Separately, Prof. Cho has developed a smartphone application that can determine the monetary value of the treated human excrement. Using this application, people can soon trade their waste for a virtual or digital currency to use. At the pavillion, the team plans to expand into selling salads made with barley sprouts, which can be only purchased with such virtual currency. “This is a very exciting project for us,” says Prof. Cho. “We expect that this will become a pivotal stepping stone in the developing future of many countries facing dangerous sanitation issues and a lack of reliable, affordable energy”. 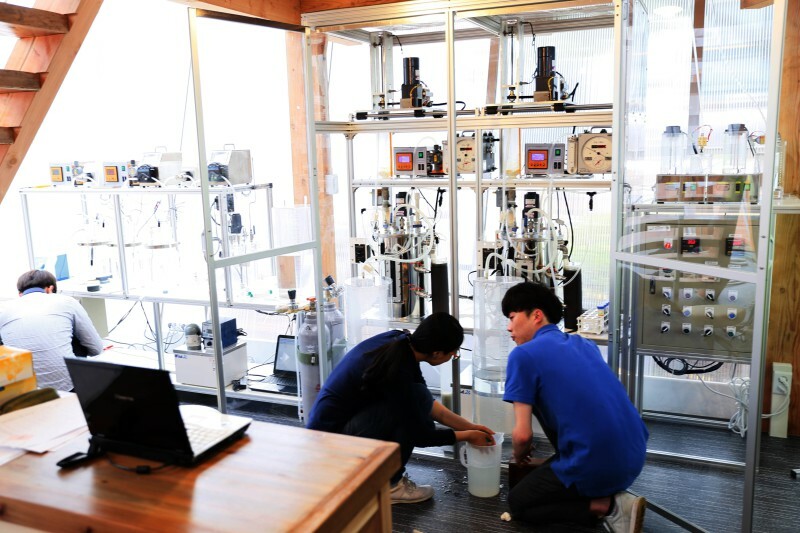 If this experiment succeeds, the team plans to expand its use of the waterless toilet system and microbial energy production system in real life. This project has been carried out in collaboration with YATOO, Art Center Nabi, Paju Typography Institute (PaTI), and Hankuk Engineering Consultants (H.E.C.). Located near the plaza in front of UNIST Business Administration Building, the Science Walden Pavillion is free and open to the public daily from 9 am to 6 pm. The pavillion also operates Docent Programs, available on selected hours. For further information or to book a docent tour in advance, please visit the Science Walden Pavillion website.